How to Paint Flowers & Plants with Janet Whittle is a complete guide to painting flowers and plants in watercolour. It features expert guidance from best selling author and experienced artist, Janet Whittle. Janet Whittle’s vibrant watercolour paintings are characterised by imaginative compositions and her use of colour. A collection of her works are brilliantly showcased in this book, which also includes step-by-step guides to all the techniques used to create her work. Be inspired by Janet’s evocative compositions that beautifully capture the glory and beauty of flowers. Learn about her techniques and see how she creates her paintings step by step. The book features detailed sections on materials, drawing, composition and techniques - each of which is accompanied by clear, step-by-step projects and pictures of Janet’s work to inspire you! This beautiful book is an invaluable resource for anyone who enjoys painting flowers or who wants to learn how to. Janet Whittle specialises in flowers and landscapes in watercolour and pastel, and is a professional artist and qualified teacher. She has shown her work at many prestigious international venues, the Mall Galleries and exhibits regularly as the Westminster Galleries in London. Her prints are sold throughout the world and gift cards bearing her work are widely available. She has won awards from many major art groups, including the Society of Botanical Artists' Founder President's Honour in 1999, and the St. Cuthberts Mill Award for a picture of outstanding quality in 2001. Also in that year she won The Society of Flower Painters' Award for Excellence for their Jersey Exhibition. This is a revised and expanded reissue of a book that appeared in the Tips & Techniques series as far back as 2003. Taking it out of the series straitjacket has been worthwhile and it looks completely fresh, even if some of the reproduction is perhaps showing its age by being just a little bit coarse by modern standards. Thats one of those minor quibbles that I tend to come up with and it certainly shouldnt put you off. Janets flowers are generally images in their own right rather than illustrations of particular subjects. She makes use of both positive and negative shapes, colour contrasts, shadows and recession to create amazing effects. Its also nice to see cobwebs, butterflies and raindrops used to enhance some of the paintings. This is a book about creativity as much as (perhaps even more than) straightforward flower painting. Its not really something for the beginner, even though theres plenty of instruction, projects and demonstrations. If you enjoy painting flowers, but want to get beyond simple representation, its ideal. Search Press have recently been raiding their backlist and breathing new life into some of their older titles. While interfering with a perfectly workable design can be a mixed blessing, the editorial and design touches have been impeccable. Starting with a clean sheet, they are picking the original apart, often completely and re-building the material in line with up-to-date tastes and the available printing technologies. As well as a change of layout, images are re-originated, resultingin sharper reproduction and more faithful colours. New material is also sometimes added, although whether this would be a criterion for re-purchase, only the reader can decide. This latest is one of the best examples of the project. Janet's work has always caught the attention, but here it positively leaps off the page with the freshness and vitality of newly-opened flower. You may be tempted even if you have the original. 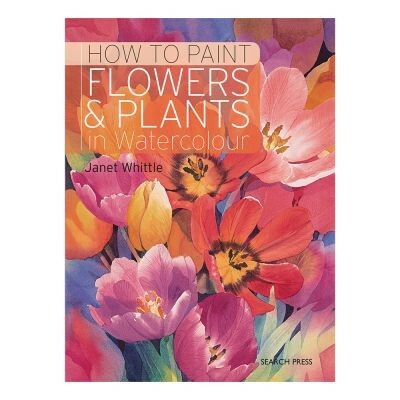 If you love painting flowers, you'll love this book full of vibrant watercolours. Clear step-by-step instructions show Janet's love of flowers and her ability to capture their very essence. Find exercises and projects to help you paint some of the best-loved flowers such as clematis and poppies and build your flower-painting skills at the same time. Find Janet's palette, tips and many examples of fantastic finished paintings throughout the book. Learn all you need to know about flower painting. This book was previously published as Painting Flowers and Plants. Due to be published in May, How to Paint Flowers & Plants by Janet Whittle is a redesigned, expanded and improved update of her Watercolour Tips & Techniques: Flowers & Plants. Janet's work is exhuberantly colourful and here she describes her working methods and materials necessary to produce lively watercolours of flowers and plants. There's plenty of advice on techniques, as well as step-by-step projects to get you started.